It sure doesn’t look like the first day of Spring. With the rain today, I worry that the apricot tree won’t set fruit this year. The vast majority of the blossoms are over, and most of the leaves have come out. That was fast; but then again, the blooming and fruiting periods of Blenheims are brief. In a few weeks I’ll be looking for evidence of fruit development (fingers crossed). 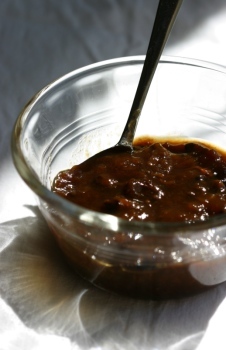 Since apricots and Spring are on my mind, I thought I’d post our apricot chutney recipe. Last year around this time, we gave a copy of this (along with a jar of the product 8-)) to our friends Samuel and Elizabeth, in celebration of their marriage. Today they’re having their annual Spring Ding party, which I’m sad to miss. 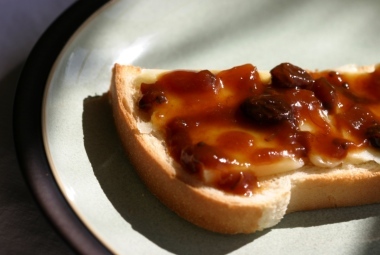 So to them I raise a long distance toast —or, rather, a toast topped with cheese and chutney! The original basis for this was a recipe from my mother-in-law, Ruth Fraser. We confess to changing the spices and accessory fruits (like the figs) from year to year. Experiment with different chilies, cardamom (and other Far, Near or South Eastern Asian spices), prunes, dates, etc. We use fresh Blenheim apricots and Meyer lemons because they grow in our backyard. We haven’t tried dried apricots, but if you do, let us know how it turns out. The variations are fun to play with! Update (25 August 2013): To answer Mark’s question from over two years ago—yikes! but it’s taken me this long to try it out—I finally tested putting the spices (except for small bits like the ginger and mustard, which are easy to chew after cooking anyhow) in a cotton bag. Oh boy, now I no longer need to carefully pick out hard pieces on my sandwiches. 😉 Although I have to be more careful when stirring, so I don’t accidentally tear the bag. Another aside: This recipe works great with pluots, especially when adding a bit (1/4 to 1/2 teaspoon) of aniseed (whole, but not placed in the spice bag, as they’re small). I think this would work well with good plums, too. The jars keep for a long time in a cool closet. We have enjoyed four year old chutney. It does age quite well, although make sure that the lids haven’t popped, to maintain the air-tight seal. Remember to refrigerate after opening a jar. 7 ounces golden raisins, or sultanas; you could substitute regular dark raisins. 2 1/2 sticks of cinnamon —the softstick variety from Sri Lanka (Ceylon) has a sweet, fruity edge; it can be found at Mexican stores. (optional) 1 star anise, broken; warning this imparts a strong licorice flavor! Put all of the fruits, except for the raisins, onions, garlic and spices into a large stock pot with a heavy bottom. Turn the heat onto medium high. Pour in enough malt vinegar so that the mixture won’t stick as you bring it to a simmer. Lower the heat to medium once you obtain a lively simmer. Add more malt vinegar as the mixture simmers, to prevent it from becoming dry or too stiff. You want to get a jam-like consistency. At this point, most (~75%) of the vinegar is usually used. Continue to stir occasionally to avoid sticking, and lower the temperature to medium low or low. Maintain a gentle simmer. After about 1 hour, stir in the raisins, lemon zest and lemon juice. Stir in the brown sugar when the apricots have become pulpy, i.e., fallen apart so there are few if any solid lumps. This usually occurs about 30 minutes after adding the raisins and lemon ingredients. At this point, most (~75%) of the sugar is usually used. The next day, bring the chutney to a simmer over medium high heat, then lower the temperature to medium low or low to maintain a gentle simmer. Add any additional vinegar and/or sugar to desired taste and viscosity. Cook for 1 hour. Make sure you have clean jars and caps handy. Ladle the hot chutney into the jars, quickly cap them, then process appropriately. As mentioned earlier, store in a cool location like a closet or larder. This chutney is best served at least 2 to 3 months after being made. This was written by sairuh. Posted on Tuesday, March 20, 2007, at 12:37 pm. Filed under Food. Tagged apricots, chiles, dips, recipe, spreads. Bookmark the permalink. Follow comments here with the RSS feed. Post a comment or leave a trackback. This apricot chutney sounds absolutely fabulous. What a great way to use up a bunch of apricots! Sounds wonderful … but when and how do the spices go in??? Hi, I don’t have figs, but have dates – I work only with certified organic products, so need to keep it strictly organic. Pity about the figs but will it make a huge difference – should I not just substitute with more raisins or something? The allspice, I cannot find. My mom says to replace with 1/2 tsp cinnamon and 1/2 tsp cloves to make up 1 spoon of allspice – clever hey (my mom’s a real good cook)? But was concerned that there is already cinnamon in the recipe. Hope the flavour does not change too much. Last but not least – the star anise, I have anise seed, but no whole star anise, does it make a huge difference to the flavour if I don’t put it in? Perhaps I should just wrape anise seed in a bag and let it boil up with the chutney. I am really excited to try your recipe, it sounds devine! Hi Sally-Anne: Certainly feel free to play with the accompanying fruits and spices! I tend to vary it every year anyhow. 😉 Star anise is stronger (hotter, sweeter) than aniseed, but I think aniseed could work (haven’t tried it myself). I generally use cinnamon stick instead of powdered cinnamon, because I can sometimes find cinnamon-y flavors overwhelming. Again, it’s a very subjective thing with flavorings. Experiment and have fun! your recipe was a hit, thank you. I used grape vinegar and more sugar, found figs and everything turned out perfect. I have a refined palate, thank you to my mother and your recipe really is tops!thank you for sharing it. Could I possibly make a suggestion. The recipe at first threw me for a 6, as I didn’t know when the spices needed to be added. I am going to make your recipe again – it truly is amazing!!! do you think i can substitute apricots with peaches – i am almost sure it will be fine? Sally, although I haven’t used them myself, using peaches sounds like a great idea! Your recipe sounds yummy, it´s definetely worth trying. Searched high & low for a place to start for my first chutney. Apricots not off the tree 20 minutes before they were bubbling away. Made some changes due to what was in the parlor. White sugar and molassass instead of brown sugar, Ghost pepper (VERY little) vs. serranos, red onion vs. white etc. It’s just come off of the heat & so far it tastes better than I had hoped. Thank you. @Mike, I’m glad it turned out well for you! Btw, I haven’t heard of Ghost Pepper before — what is it like? @Sally-Anne, it’s great to hear of your results with the chutney, especially with all those yummy fruits! I can understand how using a more sour vinegar would require more sugar, too. I have never made a chutney with whole spices. It may sound a strange question. . . Do you leave the whole spices in when you bottle the chutney (you don’t put them in a spice bag when you cook the chutney).